National #BadAssHairDay was (officially) a month and a half ago with my favorite hair brand Organix, but who's to say that we should limit it to one day, right? 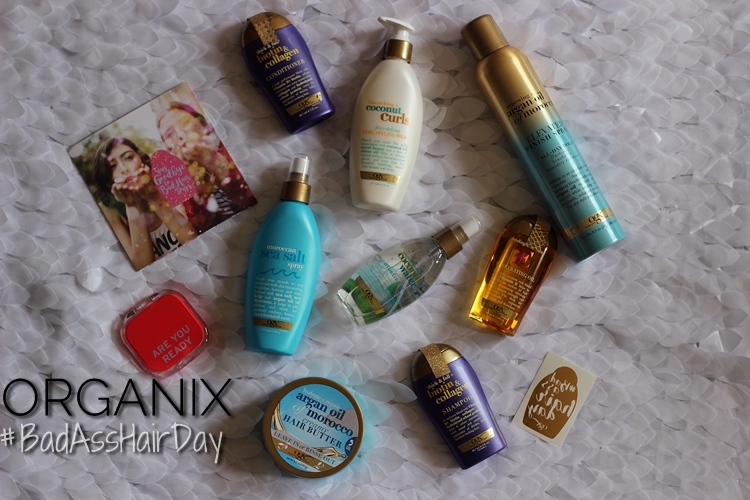 I had the pleasure of receiving a goody box from Organix that had a TON of their hair care products in it! Some new and some old to me, I have to say that they are most definitely going in the hair care stash! Come on in and take a look at what I received! You may find a new favorite inside! 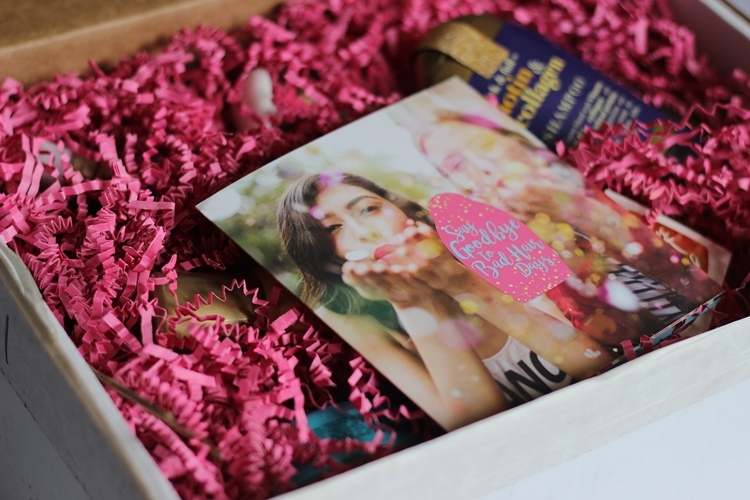 Let's start off with how cutesy this packaging is? They stuffed the box with the cutest shredded paper and included a couple more goodies in there besides the hair care items. 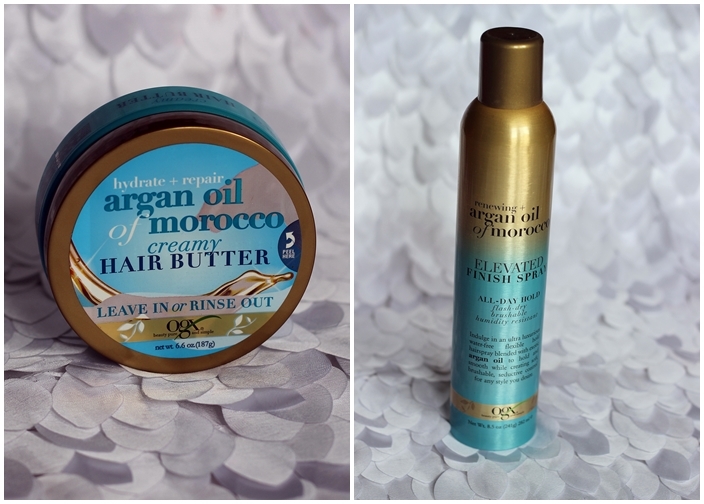 First, is my FAVORITE item out of this box which is the Hydrate + Repair Argan Oil of Morocco Creamy Hair Butter. I braided my daughter and niece hair and I used this as a protectant on their hair and the synthetic hair fibers and it works great! It also smells like heaven! Definitely a staple! Also included is OGX's first EVER hairspray, the Renewing +Argan Oil of Morocco Elevated Finish Spray! Use to add finishing touches to just about any hairstyle that you can think of! This also smells like a dream and doesn't take your breath away! 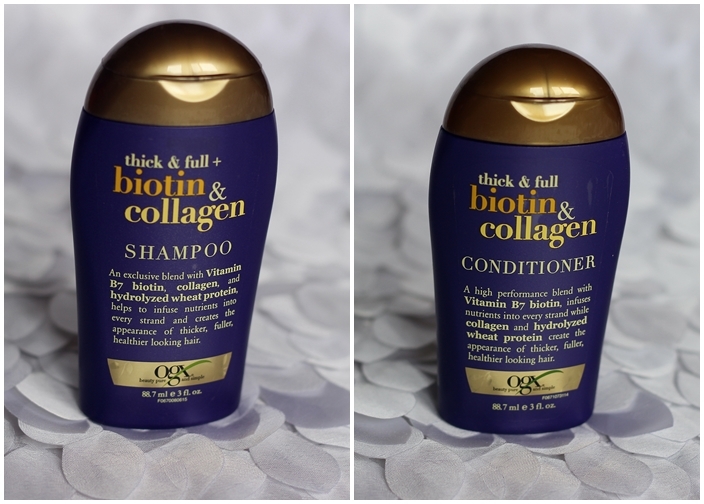 The Thick & Full + Biotin & Collagen shampoo and conditioner duo does exactly what it says. By now we know that I have thin hair (by heredity unfortunately) and a couple washes, along with my black tea rinse, helps give my hair a fuller look. 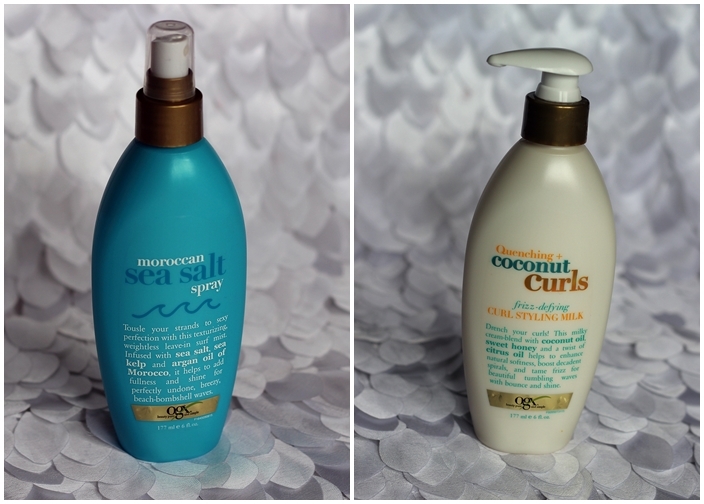 I've always loved OGX's shampoos/conditioners, so I knew these would be a great addition to the collection. Next, we have the Healing + Vitamin E Penetrating Oil is infused with Vitamin E that helps heal brittle, damaged hair with just a few drops. Will certainly be trying this out as a hot oil treatment. 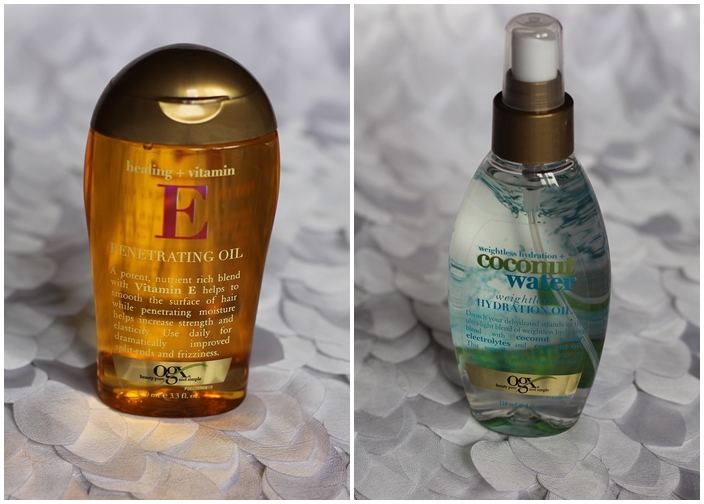 The Weightless Hydration Coconut Water Weightless Hydration Oil has to be my 2nd favorite in the bunch! I've used their weightless oils before and they are amazing, especially since I do have thin hair! It doesn't weigh my hair down and it makes it feel SOOO alive! Smells amazing too! Last, but not least, we have Moroccan Sea Salt Spray and Quenching + Coconut Curls Frizz-defying Curl Styling Milk. I wish I could say that I like the Sea Salt Spray but it didn't like my or my daughters hair! It made it super crunchy and dry and that's a no-no to our coils! 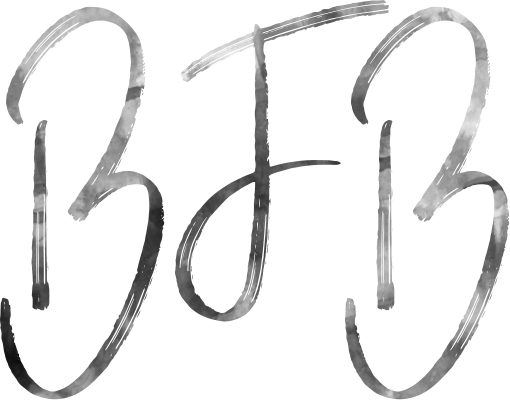 Maybe I'll try a different way of using it, but off of first impression, not my fave! The Styling Milk, however is great! Anything to hydrate of thirsty hair is a must! It great on holding of the frizz and you don't need a ton of product on your hair! 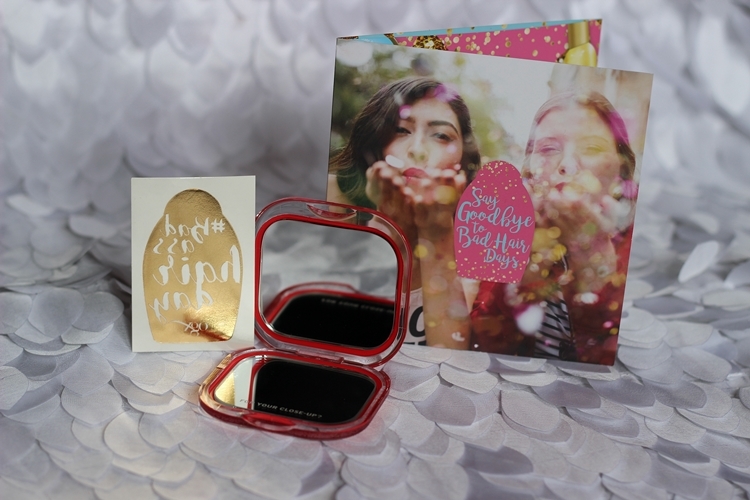 To cap off this box, they included some knick-knacks like a handheld mirror and a temporary tat, which I thought was cute! If you haven't already, look up Organix and their amazing products! You can find them at your local drugstore, Target and Wal-Mart and they are SUPER cheap!! What's your favorite Organix product that helps you have a #BadAssHairDay? Happy Monday Loves! ♥ Make sure you link up what you like below! Trying to get back into posting regularly and hope to have an outfit up Wednesday! linking up with these amazing beauties!